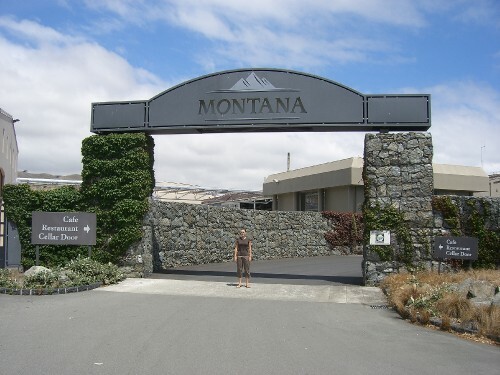 Blog from Marlborough and Hanmer Springs, New Zealand | Where is the Love? We got the Blue bridge ferry across the Cook Strait, which even on a rain soaked and windy day provided great views as we slowly worked our way into Marlborough Sound.Not much to do or see in Picton so we headed south slightly and found a Department of Conservation (DOC) campsite just north of Blenheim.The fantastic thing about DOC campsites is not the facilities (chemical toilets and cold or no showers) but the fact they only cost $6 a night and even better you pay this into an honesty box; Result. Blenheim is the centre of the Marlborough wine region and famous for the production of the Sauvignon Blanc Hannah loves to drink.As we were there anyway we visited the Montana Vineyard and treated ourselves to a tour.The tour was excellent and we saw the whole process of wine making from start to finish.The lady taking the tour was very friendly and knowledgeable and she guided us through all the different types of wine and grape and how they varied in sight, scent and taste.It actually reminded me of sitting next to a certain Roddy Adams for a day at work (only joking Roddy she knew nothing about fishing).The tour finished with us sampling the Sauvignon Blanc, Pino Gris, Pino Noir and a dessert wine or Sticky.This just confirmed that Hannah enjoys the Sauvignon Blanc best. From Blenheim we headed south along the east coast to Kaikoura. Due to a very large canyon under the sea only 1km off the shore at Kaikoura several whales and dolphins can be spotted from a boat trip. Beyond these boat trips there was not much else to see and due to the astronomical cost of the trips we got back in the van and headed to Hanmer Springs. Hanmer Springs is a small town at the northern tip of the Southern Alps mountain range and is funnily enough famous for several hot springs in the area.We checked into our campsite (no DOC ones here unfortunately) and after a short walk round the town headed for a soak in the relaxing hot springs.Next stop Christchurch.